Constructed with natural stone, NatureStone comes in a rock or smooth finish, making it the perfect structurally sound retaining wall with an aesthetic to match the Australian landscape. 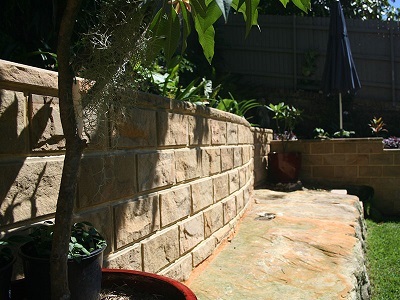 NatureStone is a part of the BelleStone range of products from Baines Masonry, and offers a cost-effective retaining wall option that is also easy to lay and reinforce. The retaining wall system comes complete with wall blocks, capping, corner returns and sills for a wall project. NatureStone retaining wall system uses the patented ‘Hendrick’ system of adhering natural stone to structural masonry blocks. The system uses high strength, purpose neutral-cure adhesive, and 316 marine grade pins, fixed mechanically to the top and bottom of each block to ensure integrity. Building a retaining wall using NatureStone wall blocks offers multiple advantages to the builder during construction. The lighter weight blocks are easily handled by the tradesman during laying to allow for quicker installation. The block’s design enables engineers to use standard design tables, while also ensuring the project meets the AS3700 standard and BCA compliance. There are environmental benefits too since the Betta Blocks are created using recycled materials and less concrete. To visualise your project using the NatureStone retaining wall system, use the new Masonry Designer Software from Baines Masonry.